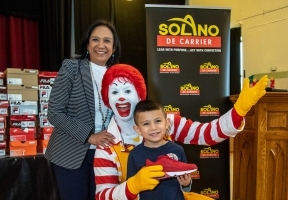 Local McDonald’s Owner/Operator Carmen Solano-DeCarrier, and Martin Brower partnered to provide more than 600 pairs of athletic shoes to at-risk children. The donations were made through four community organizations: Casa Central, Erie Elementary Charter School, Erie Neighborhood House, and Back of the Yards Neighborhood Council. This is an effort to motivate children to go to school and exercise. Sometimes kids even skip school because they don’t have appropriate shoes. It is an issue that it is often ignored but it is important to address. 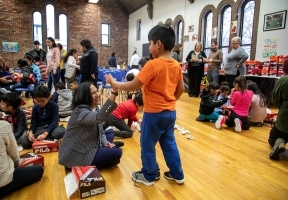 This is the third year in a row that Carmen Solano-DeCarrier has partnered with another company, this year being Martin-Brower, to donate shoes to more than 600 kids in at-risk situations. This donation not only offers children the possibility of having proper footwear for physical development, it gives them joy and motivation. This shoe donation is in addition to the backpacks given every year by owner-operator Carmen Solano-DeCarrier in her McDonald’s restaurants as part of her back-to-school program.